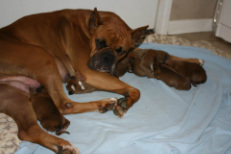 I started searching for a Boxer breeder in the States that health tested their breeding stock and produced really good quality Boxers as I was looking to add some specific qualities to my breeding program that I felt I would find in the North American Boxer. I 'met' Paula a couple of years ago through Facebook when I saw photos of a gorgeous litter of pups she had just bred. Paula and I started to communicate and over time I came to view her as not only an exceptionally ethical and conscientious breeder, but an amazingly loving and caring person and she soon became one of my dearest friends. In 2012 when I heard that she had another litter on the way I inquired whether she would be willing to part with one of the pups to join me in South Africa. She agreed and so started an amazing journey of trials and tribulations (thanks to the South African import requirements and the heat wave in Texas) as well as excitement, wonder and planning. Paula not only went the extra mile to ensure my puppy came to me, but she actually went WAY beyond what any breeder could or should ever be expected to do. No task was too much for her. No hassle not worth tackling. Thanks to her exceptional perseverance, a few weeks later I welcomed Gentry's Quantum Leap into my life and into my family of Boxers. Raffy arrived with no adverse affects of his very long trip from Texas to Cape Town, via Atlanta, Frankfurt and Johannesburg, and came out of his crate wagging his tail and looking for action. He is the most exceptional puppy I have ever owned as far as temperament is concerned and I firmly believe this is due to Paula's rearing of him and his litter mates. I would get another Gentry Boxer from Paula in a heartbeat." Monique Hodgkinson, Tanyati Boxers, Cape Town, South Africa. Accredited Boxer Specialist Judge and Working Group Judge. I have had two Gentry Boxers and they are the loves of my life! Almost 15 years ago, I contact Paula about a Boxer pup. Before I contacted her, I did a lot of research and wanted to get a puppy from a responsible breeder. By responsible, I mean a breeder who cares about the betterment of the breed, someone who truly cares about the health and temperament of the Boxers, not just the looks. I had never had a dog up until then, and when I called Paula she talked with me for hours to make sure I would give one of her dogs a great home. She selected a dog for me, based on the temperament. Hugo was my best friend for over 10 years. She helped me through all the questions I had the first year of his life, and when he was passing away she was there for me. Now I share my life with Charlie (Gentry's The Trouble with Tribbles), whom I adore, also from Paula. Charlie helps me to evaluate homes for potential adopters of rescue boxers, and he always has good judgment about them! 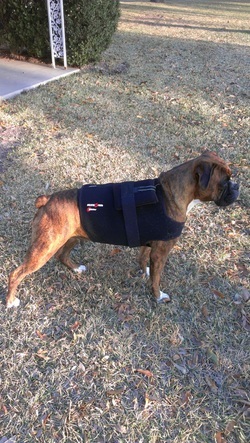 Gentry Boxers runs all the health test for known hereditary diseases for Boxer they breed. 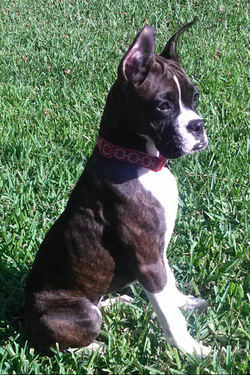 Not only are they beautiful, they are healthy, wonderful Boxers with great temperament. Thank you so much for what you do. Tia is a spitfire! We are training her in agility and conformation. I want to personally thank Paula for all she's done to breed and raise such a wonderful litter! Between careful and thorough health testing on mom and dad, the homeopathic support, ustream coverage, raw diet, potty area clean up, etc, they have the best start any buyer could ask for! I am now a boxer convert! I consider myself very blessed to not only know, but to co-breed boxers with Paula. She has taught me so much. Her breeding ethics are uncompromising and at a level which I hope to someday achieve. I am so grateful to have this woman in my life and in the world of boxers. I met Paula in November last year when I inquired about renting her holter to start health testing my boxers. 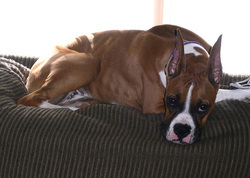 She opened my eyes to just how important health testing was, especially for breeding boxers. Paula has been a great mentor and has helped us to accomplish so much in our breeding program. Now, with our next adventure being in the show ring, she has guided us to all the right people to make our dream a reality. Above all, Paula's friendship has been the most important thing to me. She is always there via email, Facebook or text. I am so very glad to have much such a wonderful person who shares our love for the boxer breed. Thank you for everything Paula!